If you want to more fully experience Holy Week, the journey with Jesus from Palm Sunday, his triumphal entry into Jerusalem, through Holy Saturday, the day after his crucifixion, step into these daily prayers for Holy Week. Prepare your heart for Easter, by stepping fully into Holy Week with these readings and prayers. These are prayers I’ve written based on the daily Scripture readings in the Lectionary. Start with the readings for the day, consider the reflection questions, then use the prayers to begin your conversation with God. Be sure to check out these 10 Holy Week activities to make your Easter more joyful, too. 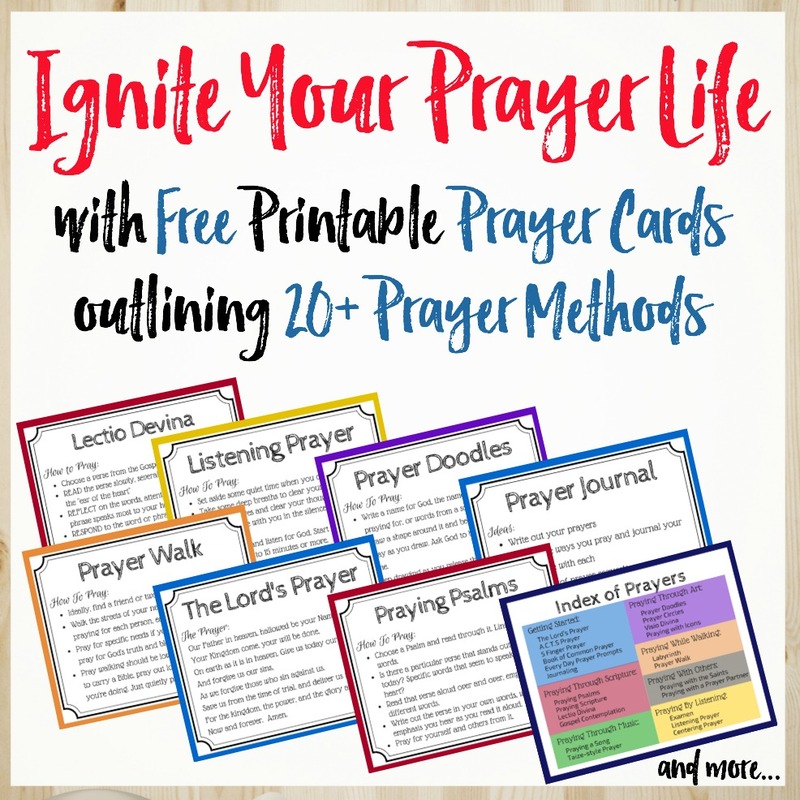 Join our 'Prayers and Possibilities' newsletter for weekly encouragement and I'll send you a printable of these Holy Week prayers as a FREE gift. How does walking in the way of the cross lead to light and life? What does God promise us about following Jesus? As we begin this final week of Lent, this Holy Week leading to Easter, how can you submit yourself to walk in the way of the cross, placing your hope and trust in Jesus? Take time to read the Gospel readings this week and step fully into the story with Jesus and the disciples. Deeply feel the emotions of the week, so you can more vividly experience the joy of Easter on Sunday. Almighty Father, who sent your only Son Jesus Christ to save us from our sin, show me how I can honor you and bring glory to your name, by walking in the way of Jesus. Give me grace and mercy as I try and fail, guidance when I’m not sure which way to go, and wisdom to trust you in all things. For your love brings light and life to all who seek it. May I seek you ever more as I walk with you through this Holy Week and beyond. Amen. God chose the foolish, the weak, and the low to serve his glory. He didn’t come in a great show of power and might, but in humility. Jesus died on a cross, a most humiliating and painful death. These were great stumbling blocks to many in recognizing who Jesus was and believing. What about you? Jesus said, “if anyone serves me, he must follow me.” How are you serving Jesus? How are you picking up your cross and following him? Jesus said “do not let darkness overtake you… become children of the light”. How are you putting your trust in Jesus to save and protect you from the darkness of this life? How can you further commit your heart to him and walk in his light? O Heavenly and Almighty Father, who sent his only Son Jesus to live and die as one of us, save me. For all wisdom, all strength, and all glory is in you. You are my rock and my redeemer, my shelter in the storm. In you I place my trust, so that I may have hope. Let me walk in your light all my days, seeking only you. I give you my life to love and serve you, following you in all that I do. Amen. Jesus endured rejection, shame, betrayal, persecution, and more. We are not promised an easy road as believers. In fact, we’re promised that a life of following Christ will be difficult. So, how can you persevere in your journey to follow Jesus? How can you take hope and encouragement from the “great cloud of witnesses” to endure the race before you, with joy? How can you ‘throw off everything that hinders and the sin that so easily entangles”, so you can step fully into the life God has planned for you? Jesus, you suffered greatly for our benefit. You walked the hard road through shame, betrayal, persecution, rejection. Yet, you only desired good things for us. You came in glory to save us and redeem us from our sins. You came to offer us light and life, a hope in you that surpasses anything the world can offer. So, why do we too often turn our backs? Why do we give in to questions and disbelief when the road gets hard? Why do we look for easier paths to follow? Lord, lead me in your way, encouraging me to persevere on the hard days, remembering the great hope I have in you. Amen. How are you living out Jesus’ commandment to love one another as he loves you? Are there areas of your life where you need to bring this into more focus? Jesus humbled himself to wash the feet of his disciples, explaining that to lead you must serve. How are you leading – in your family, in your work, in your church, in your community? Are you leading by serving? How can you be a better leader by following Jesus’ example? O Lord, the King of Kings, who led and taught not as a mighty ruler, but a servant leader, show me how to lead and live through love. Teach me how to love and serve others with a gracious and humble heart. Help me to always remember your words, being reminded each time I come before your table to share in the cup and the bread. As I come before you to eat the bread of redemption and drink the cup of your salvation, may I recommit my heart to serving you and leading through love. To you, O Lord, who are mighty to save, pour out your mercy and grace and lead me in your way. Amen. Spend time today walking the road to Golgotha with Christ. Read today’s Gospel reading, imagining you are there witnessing Jesus’ final day and his death. Sit with those emotions, the grief, the emptiness of a world with Christ. Consider a world without Christ. How does this make you feel? What would be missing from your life without Jesus? What must have his followers thought as he died, not knowing what the next days would bring? How would you have reacted? Knowing the rest of the story, how can you find hope in Good Friday? O Jesus, on this day we remember your death, the day your light went out from this earth. We sit in the darkness today, remembering the trials you faced on our behalf. You have borne our sin and made the ultimate sacrifice to save us. Today, as we recall your final hours, we consider a world without you and hold onto the hope we know we have in you. Lord, commit my heart ever closer to you, because I don’t want to live in a Good Friday world without you. I want you and your light in my life. I believe in you and want to follow you all the days of my life, even knowing the road ahead will be difficult. Come, Lord Jesus, come and fill this world with your light. Amen. As you observe Holy Saturday, the day we hold vigil while Jesus lay in the tomb, consider the depths of God’s love for you by giving his own Son to save you. Knowing what comes tomorrow in the story, how does today help you better trust in God? Could the disciples have fully envisioned the next chapters in Jesus’ story? How do you think they still trusted in God, even through these latest events? How can you trust in God, even when his ways don’t seem to make sense and the days are dark? How can you still trust in God’s love for you? Heavenly Father, what great love you have for me that you would send your only begotten Son to die for my sins. How can I ever doubt your love or your ways? Yet in these dark moments, I start to question and doubt. I wonder what comes next and I fail to recall your great faithfulness. Lord, forgive my unbelief and help me believe. Help me to trust you in all things, in all times, even through the valleys and dark seasons of my life. For you are my rock and my refuge, my strength in the storm. Your love never ceases, your mercies never end. You are enough for me – more than enough. Help me to remember that all the days of my life. Lead me to walk in love, as a shining reflection of your love into this world. And help me live the life you desire of me, bringing glory to you in all that I do. Amen. Want a more immersive experience for your Holy Week prayers, diving deep into Jesus’ final week? The 7-Day Journey to the Cross devotional is a daily focus on Scripture and prayer to help you draw nearer to Jesus and experience the fullness of his great love for you through his final week. Click here to get your copy of Journey to the Cross today!